A Delicious Last Minute Dessert that everyone will love as all of your favourite treats are included! Super Chocolatey, and super easy to make! 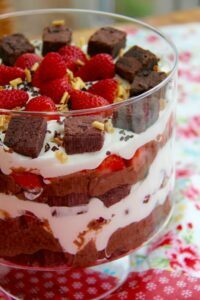 I decided to make this delicious Trifle a Chocolatey themed one as I utterly adore Chocolate, as you can tell, and because there are so many readily available normal trifles to buy, or even so many more recipes for normal trifles that I thought it would be nice to do something a little different and yet still amazingly delicious! For this recipe, I used ready made everything. The brownies are shop bought, but you can obviously use your own if you bake them! If you do, I recommend my Triple Chocolate Brownies, or my Chocolate Orange Brownies as they are both so easy to make, and are so delicious too! 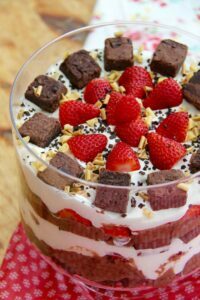 The only real things you have to do in this is whip up the cream, mix together the Chocolate and Mascarpone (or Custard) and then layer everything together! It really is that simple! I must admit, and you can see, that I never really 100% concentrate on the look of a trifle, as personally, I think it all just pushes together at the end of the day anyway, but even in these photos you can see the layers *just about)* and doesn’t it just look utterly scrumptious?! The fresh fruit brightens up the dessert just enough, and gives it that bit of freshness that this sort of dessert will desire. Seriously though, it took me less than 10 minutes to put this dessert together, yet it looks amazing, and EVERYONE will utterly adore it! 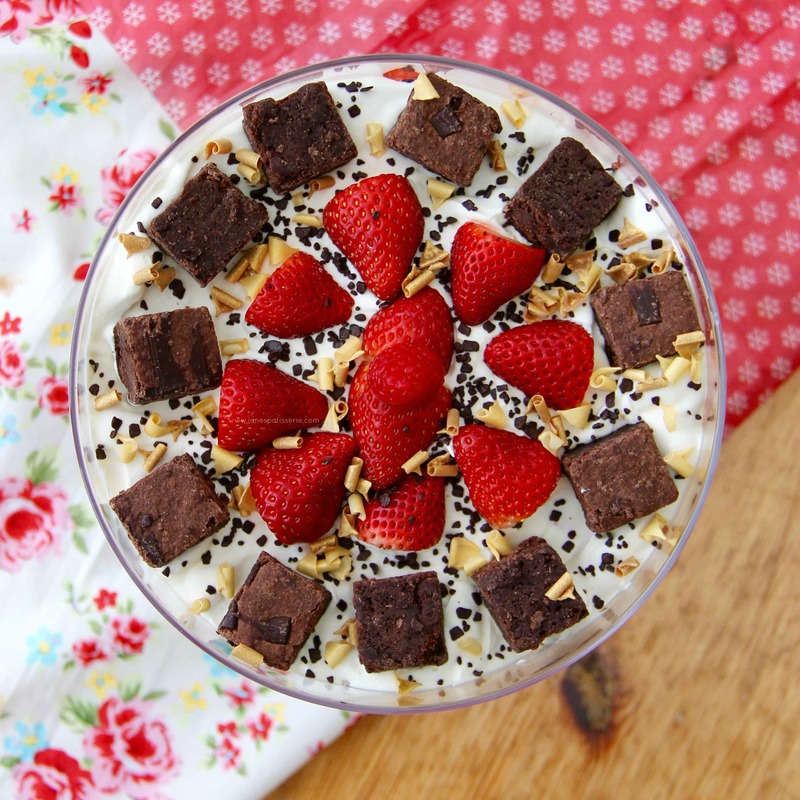 This fills a 20cmx20cm Trifle Bowl – and can easily serve 10-12+! 1) Melt the 200g Chocolate in a double-boiler/microwave on short bursts until smooth – leave to cool slightly. 2) In a separate bowl, whip up the Double/Whipping Cream to soft peaks – its better for it to be sloppier rather than over whipped. In another separate bowl, loosen the Mascarpone/Custard and add the slightly cooled chocolate – beat till smooth! 3) Layer some of the Brownie Bites onto the bottom of the dish so its covered (doesn’t have to be exact!) Then dollop on 1/2 of the Chocolate mixture – spread evenly. Add on 1/3 of the whipped cream and spread evenly. 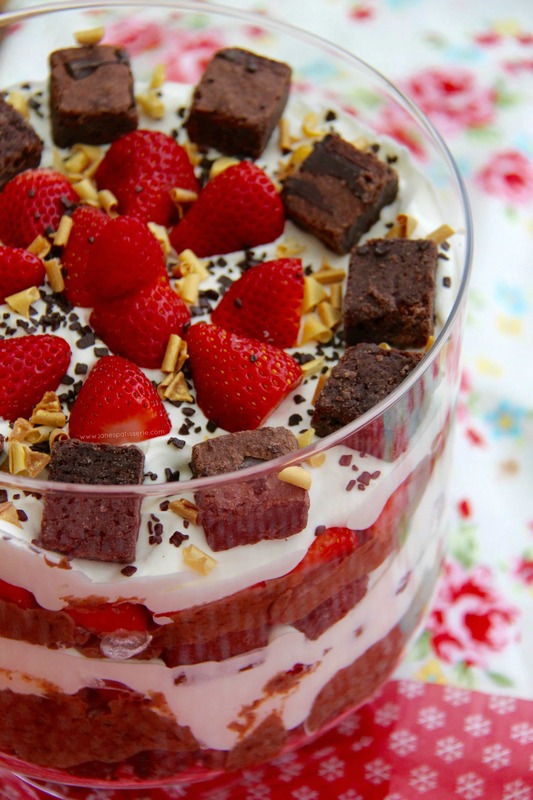 4) Cover the cream layer with the bag of Maltesers, then cover with all of the Raspberries. Cover with another 1/3 of the whipped cream, then add another layer of Brownies. Add the rest of the Chocolate mixture and spread evenly. Cover the top with the strawberries and then cover with the final amounts of cream. 5) With any leftover treats, such as with me I had some Brownie bites & Strawberries, decorate how you please. Sprinkle on some sprinkles and you’re finished! Refrigerate until needed. I say Mascarpone/Custard as some people will want Custard as custard is traditional in trifles, but I like either. 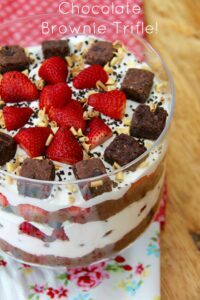 Both make a chocolatey delicious layer that will marry perfectly with the rest of the ingredients either way! I obviously layer mine in the way I do – but this isn’t an exact science obviously. 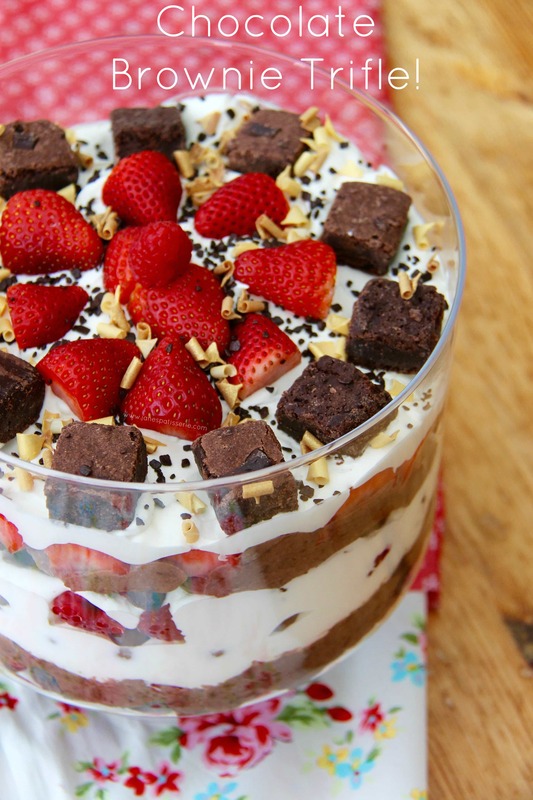 (Just incase you missed it, my layering is – Brownie, Chocolate, Cream, Maltesers, Raspberries, Cream, Brownies, Chocolate, Strawberries, Cream, Decorations! 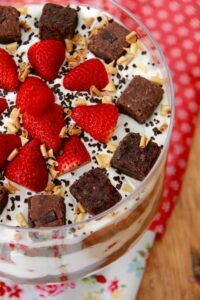 This dessert is very quick to make, but will only last 3 days, covered, in the fridge, and keep an eye out for the dates on your fresh ingredients! Find my other Dessert, Brownie & No-Bake Recipes on my Recipes Page! Older Next post: No-Bake Terry’s Chocolate Orange Tart! Newer Previous post: Funfetti Cupcakes! Thats a wonderful idea, It’s beautiful, and I know it’s really delicious. Such a creative way to use brownies.Happy Holidays!! Thank you so much, Suzanne! ☺️ and Merry Christmas to you!